As you probably know, November 4th 2008 is a big day for the US - the day that the third Futurama Movie "Bender's Game" is going to be released on DVD and BluRay. For me, November 4th was a few days ago. FOX send me a pre-release screener copy of the next Futurama incarnation so that I could tell you what you are waiting for. And that's what I'm, going to do now. It's not easy to write a movie review without giving away some of its plot. I'll do my best to keep the plot spoiling to a minimum. With all known rips in the time-space continuum fixed, Bender's Game starts a brand new tentacle-free story arc with a fantasy element. 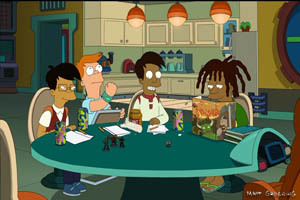 While Futurama usually gets its humor from putting a sci-fi spin on present-day issues, the venture into a Dungeons and Dragons theme works out pretty well. While having some experience with pen & paper games might help "getting it" in some scenes, it should suffice to know that dice played a big role for nerdy teens in the 80s. I myself only went through one very long night of role playing but did not feel like I was missing any jokes or references. Plot summary (small spoilers): The movie opens with an extra-long intro scene inspired by the Beatles. It takes a while for the story to get started; the first 22 minutes do not make it obvious what the next hour could be about. 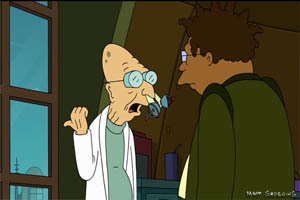 The second segment has Bender occupied with his own little side story, and Professor Farnsworth decides to go after one of his long-time foes. The plot becomes a lot more focused at this point. 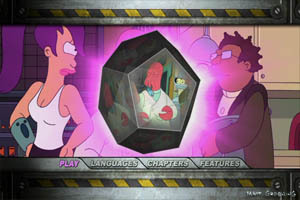 In the third segment, Bender's and Farnsworth's sub-plots come together, which causes the setting to suddenly change to a fantasy-themed world. The main story continues and eventually comes to a close back in New New York. While the build-up to the main story takes a while, it is funny, original and does not feel slow at all. There are two segments with man-of-many-trades Sal at the beginning of the movie that I think could have been shortened. My second and last issue with the plot concerns the latter half of Bender's side plot. It's reminiscent of an episode from the third season. It could be seen as an homage but at the time of watching it, it felt more like a twisted rehash. Luckily, neither of these two segments went on for too long and neither stopped me from liking the movie a lot. The pacing of Bender's Game feels right, the characters are all spot-on and funny (especially Zoidberg!) and things like social commentary that made Futurama more than a slapstick cartoon are present, too. There are a few areas where the Futurama universe is expended on, but Bender's Game is less plot-driven and has more of a lighthearted story than than Bender's Big Score. Unlike the name suggests, it is not focused on Bender alone. Which is a good thing in my view. The four segments that will eventually be aired as individual episodes fit together well and are funny from beginning to end without noticeably slowing down or recapping the story every 22 minutes. The fantasy part makes the movie feel somewhat like a long Anthology of Interest episode, as the writers took some liberties with "sense-making". But hey, it's fun. As with the last two movies, Bender's Game is produced in wide-screen format. The drawing and animation quality is again very high as you can see from the screen shots on the right. The coloring and lighting is nice throughout the movie and the 3D animation fits in perfectly without feeling out of place at all. However, my screening copy does have problems on the technical side. During fast pans and zooms with saturated colors in the background, I spotted severe compression artifacts. I don't know if this has to do with my screening copy being watermarked and thus likely reencoded. I don't remember seeing noticable compression artifacts in any of the other Futurama DVDs. Ignoring the artifacts, Bender's Game deserves 9 out of 10 points but I will substract a point until I can verify that the compression artifacts are not to be found on the final disc. UPDATE: Looking at the actual retail version, the artifacts are gone. Nine points on the video quality. To be honest, I have a hard time remembering the background music. I suppose good background music remains in the background. 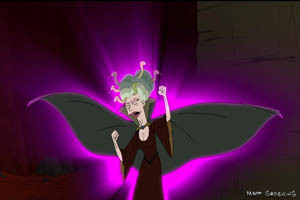 It just sounded like Futurama is supposed to sound, and the themes of the fantasy segments suit the setting. They made a good choice in having Christopher Tyng, who has been doing the scores for Futurama since the beginning, create the musical atmosphere again. The voice acting is spot-on for all characters, with Dr. Zoidberg and Mom probably being my favorites in Bender's Game. The list of extras goes on and on. As Matt Groening fans have gotten accustomed to, there is a full length commentary track where the writers, producers and artists talk about what's going on on screen. A featurette tells a bit about the Dungeon and Dragons background of several of the Futurama staff. An animatic shows the first segment in an early production stage (with somewhat different dialogue, so watch it!) and only the key frames drawn. The minor extras include a little game lets you mix different characters from the show, a tutorial on how to draw them yourself, some background info on some of the 3D vehicles, some voice acting outtakes, a deleted scene, and a funny warning by Bender not to copy/steal DVDs. There is also a sneak peak at the fourth Futurama movie and a little easter egg! I am tempted to just copy and modify what I wrote for the last movie regarding the DVD menu as that's how the new menu was likely created. Call it continuity if you want. 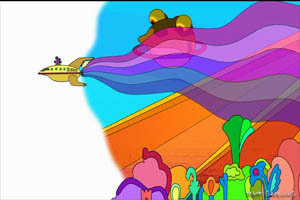 The menu design is pretty standard, with clips from the movie and a loop of the Nimbus ship circling some tentacles a 12-sided die while a short remix of the Futurama theme plays in the background. Nothing too special here, but nothing annoying either. The submenus feature eerie music and old horror movie style fantasy-themed music and backgrounds. My screening copy came in a simple paper sleeve. I will withhold my verdict on the packaging until I hold the retail version of the movie in my hands. The packaging of Bender's Game has a nice metallic look and great looking graphical design both on the inside and outside. My copy came with a couple of Futurama post cards, which makes for a nice extra. The only drawback of the packaging is that the disc is not really well protected in the cardboard slide-in sleeve. It might be a good idea to keep the actual disc in a different case while keeping the original one for on the shelf. The reason for the cardboard design decision is that Bender's Game is carbon neutral, as Zoidberg informs us on a logo. Looking back at the first two movies, "Bender's Game" neither creates the level of confusion that "Bender's Big Score" did nor does it suffer from slow parts like "The Beast with a Billion Backs" did at times. There is very little to complain about with this movie. Its story is fun to follow and much of what defined the appeal of Futurama is in there: Well-defined characters in a sci-fi (and fantasy) setting with often hilarious lines that do not turn into slapstick comedy. If I had to rank the three movies, I would place Bender's Game in the middle but close to my current favorite "Bender's Big Score". It's very enjoyable and should not be missing on any Futurama DVD shrine. Bender's Game is available from amazon.com for $19.99 in DVD format and for $27.95 in BluRay format. 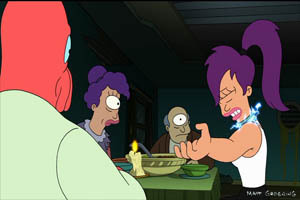 Futurama TM and © 2008 Twentieth Century Fox Film Corporation. All Rights Reserved. Our review copy was provided by FOX.